Stoney Middleton’s SMILE Village Day was the setting for a Carbon Footprinting Stall on 11th June. 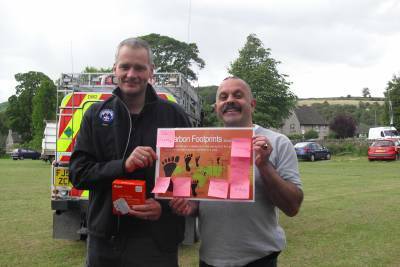 Villagers in the Peak District village had the chance to find out what impact their lifestyle was having on the environment and how they could improve it. There was a lot of interest in domestic renewables and low energy lightbulbs. At the end of the day the person with the smallest footprint – Phyllis (pictured with SMILE Secretary Chris Tsielepi) – received a locally made pork pie, whilst the person with the biggest– Ian (also pictured) – received a TV powerdown to help begin shrinking his footprint. 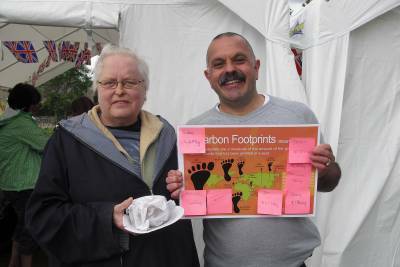 The average footprint of all those surveyed was 10.8 tonnes, compared with a UK average of 9.8 tonnes. Anyone can use MEA’s online We Save tool to help monitor and reduce their carbon footprint: www.wesave.org.uk. 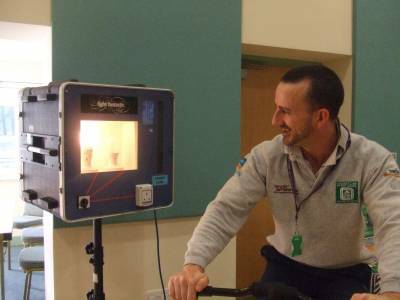 Members of a Nottinghamshire-based environmental group have recently completed a Low Car bon Communities project which will save villagers money on their energy bill and lower their carbon dioxide emissions at the same time. Members of the community group Greening Kinoulton have spent five months working in partnership with Midlands-based environmental charity Marches Energy Agency (MEA) to offer projects including volunteer training to those who would like to help householders to reduce their energy usage, energy surveys for local buildings, teaching sessions in the local primary school, and a renewables workshop. 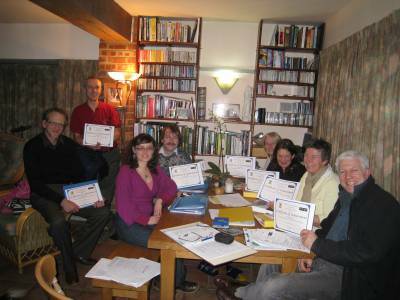 The volunteer training has resulted in a group of local volunteers (pictured with their certificates at the end of the training) offering to visit the homes of local people to offer tailored energy efficiency advice to help them reduce their energy usage. Similar projects in other parts of the country have seen average bills fall by almost a fifth in homes which have taken part. The Energy Surveys of local buildings have resulted in the soon-to-be-opened village shop installing loft insulation, solid wall insulation, energy efficient lighting and a highly efficient boiler for heating and hot water. All of these measures will reduce the shop’s energy bill. 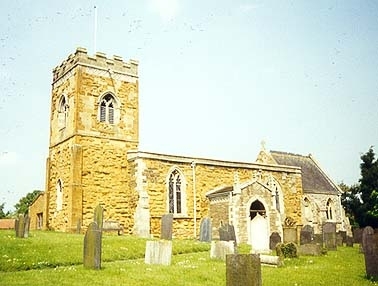 In addition, three village halls and St Lukes Church in Upper Broughton (pictured) were surveyed. Kinoulton Village Hall has subsequently submitted a grant application for funding towards a photovoltaic solar panel. The project has worked with a range of local organisations including Greening Kinoulton, three village halls (Kinoulton, Hickling and Upper Broughton), St Lukes Church in Upper Broughton, and Kinoulton Primary School. 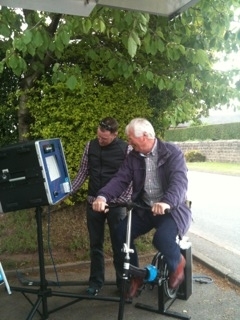 It has been funded by Rushcliffe Borough Council. 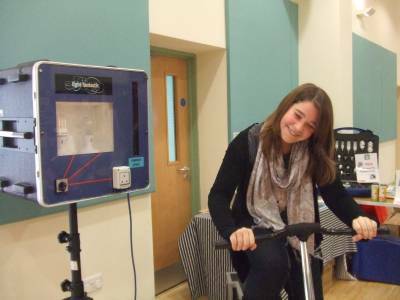 Local residents were given a chance to power lightbulbs with leg power when the Indoor Fantastic Home visited Harworth in Bassetlaw, Nottinghamshire on 24th February. Advice was given out on domestic energy efficiency and renewables, alongside free items which will help people to save energy and money at home. 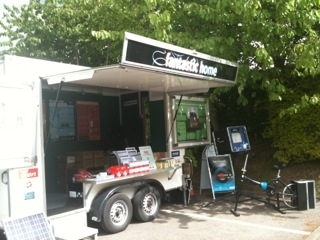 The Fantastic Home formed part of a larger 'Greening Fair' event which took place at Harworth Parish Centre.